On Popular Problems, his thrilling new studio album, Leonard Cohen gets down into the avenues of our dreams and sets a new tone and speed of hope and despair, grief and joy. Cohen here is an astonished lover rocking to the human condition as "the soul unfolds in the chambers of its longing." His legendary basso resonates as never before with a presence and urgency that arises from the very depths of the heart. The clarity and strength of these nine hypnotic songs will have us singing them over and over. 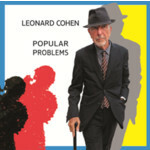 Popular Problems was produced by Patrick Leonard, mastered at Marcussen Mastering and was recorded and mixed by Jesse E. String with additional mixing by Bill Bottrell. It is Leonard Cohen's 13th studio album.